Left handers unite! Take pride in knowing that you are among a select group of left handed people that includes famous artists, scientists, musicians, presidents, authors and sports figures—a group that consists of only 10% or less of the population. 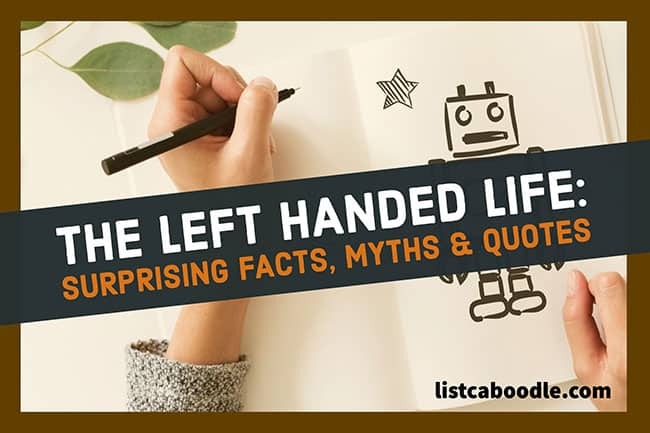 Many myths and lore exist in popular culture about the left hand. Here are ten common questions about being left handed—with answers that may surprise you. Left handers live in a world built for righties. Nothing seems to be made or built with the lefty in mind. Why have they been overlooked? How does a person become left handed? Who are some of the most famous left-handed people? Here are answers to some of the most common questions about left handedness. What causes a person to be left handed? Hand preference can be influenced by a person’s genes, which includes a genetic bias towards right handedness. Scientists have found left handedness has more of a chance to take over when the genetic right-hand bias is weak. Studies have shown that pregnant women over 40 years old are more likely to have a left-handed baby. Left handedness is also twice as common in twins. Yes, only 10% or less of the population is left handed. The preponderance of right handedness (90%) aligns with other right-side, biologically-dominant traits, including hearing (60% right-eared), vision (70% right-eyed) and foot dominance (80% right-footed). What do you call a left handed person? August 13 is International Lefthanders Day, an annual celebration of the uniqueness of being left-handed in a right-handed world. What are some common phrases and sayings about left handers? Do left handers have a higher IQ? A case can be made for higher intelligence among left handers. For example, lefties make up a larger-than-average portion of certain highly-intellegent groups: 20% of Mensa members and almost 18% of American presidents. Some positive traits commonly attributed to left handers are high IQ, creativity, multitasking ability, problem solving, memory retention and above average verbal skills. The concept that lefties are predominantly right-brained is a myth. Most left-handed individuals are in-fact left brained, in line with the general population. However their brains may show higher aptitude in typical right-brained abilities like math and achitecture. Are left handers less healthy? Left handers have been looked down upon historically and even forced to become right handed by parents and teachers. A popular convention held that left-handed people are evil, the sign of the devil. Lefties have been labeled as neurotic; their behavior rebellious and criminal, and some accused of homosexuality. Just more left-handed myths. There is some evidence that suggests lefties are more susceptible to allergies, asthma and insomnia. A 2013 Yale University study of mental health patients showed a larger-than-average number of left handers. 40% of patients with schizoaffective disorders reported left-hand dominance. Similar studies suggest a link between left handedness and dyslexia, ADHD and certain mood disorders. Are left handers better at sports? Yes, it seems lefties have an edge when it comes to individual-player sports like tennis and boxing. They are also noted to excel in swimming and baseball, especially as a pitcher. Left-handed creator of “The Simpsons” Mat Groening made two of his lead characters left handed: Bart Simpson and his goofy next-door-neighbor Ned Flanders. In the Season 3 episode “When Flanders Failed,” Ned opens a lefty-themed store—the “Leftorium”—in the local mall. The business fails, for there just aren’t enough left handed customers in Springfield. Eight of the United States’ 45 presidents were left handed. That’s almost 18%, or double the number of lefties found in the general population. Interestingly, there were no left-handed American presidents until James Garfield in 1881. After Garfield, seven lefties would become president, including three in a row beginning with Ronald Reagan in 1981.
Who are the most famous lefties? What words are typed with only the left hand?